Situated between Friendly Center and UNCG, Sunset Hills is a charming, established neighborhood featuring historic homes built between 1925 and 1965. This older, tree-lined neighborhood is on the National Register of Historic Places and maintains its strong sense of community with two parks, tennis courts, sidewalks, and locally owned shops and restaurants. Homes in Sunset Hills draw architectural inspiration from the Tudor Revival, Georgian, Traditional, and Neoclassical styles. Classic one-story, two-story and bungalow brick homes are in abundance with home prices ranging from the low $200s to low $400s. Sunset Hills’ close proximity to downtown make it a desirable neighborhood for those who work downtown or at the university. The Sunset Hills Neighborhood Association holds several annual community events including a Memorial Day weekend Pig Pickin’ in the Park, a July 4th parade, annual neighborhood yard sale, and a Halloween party in the park. It’s also the site of the Running of the Balls, a nationally recognized 5K run through the neighborhood’s lighted Christmas ball display each December, raising funds for Second Harvest Food bank. The iconic Christmas Balls are a tradition that originated in Sunset Hills and have now spread to other areas of the country, gathering canned goods for local food banks. In the heart of Sunset Hills, on the border of neighboring Lindley Park, is the popular corner of Walker Ave. and Elam Ave. Known as “the most colorful corner in Greensboro,” this small business district features several locally run establishments including Sticks and Stones, Fishbones, Lindley Park Filling Station, Emma Key’s, Bestway Grocery, and Common Grounds Coffee. Neighbors can walk to the corner for a bite to eat or to grab a drink on one of the outdoor, dog-friendly patios. Also each Saturday, the Corner Farmers Market is held in the parking lot of Sticks and Stones, and features local growers, bakers and artists selling their fresh produce, locally raised meat and dairy products, baked goods, and a variety of artwork such as pottery, jewelry, woodwork and textiles. 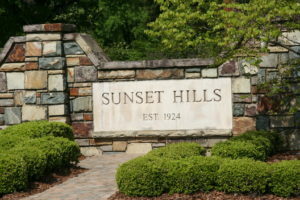 Sunset Hills is a vibrant community comprised of residents of all ages. The neighborhood retains an aura of friendliness and “porch sitting” of days gone by that makes it a desirable place to live in Greensboro. Just Click the Apply button to see the listings in the Sunset Hills Area- to see this search full screen, Click Here!